The Governor of Ekiti State, Dr. Kayode Fayemi, has said the Yoruba race needs to be more tactical in order to actualise the call for restructuring, reports ITREALMS. Fayemi urged the proponents of the policy in the region to change strategy and reach out to other regions on how to actualise the dream of Nigeria being restructured economically and politically. Fayemi spoke in Ado Ekiti on Saturday at the opening session of thr 2019 National retreat of the Afenifere Renewal Group (ARG). Fayemi said: "There are those who entertained fear on this issue of restructuring and whether this is legitimate or not, we must reach out to them, because we are not an island onto ourselves. "We don't need to be shouting on the roof top before we get it, but if we want to do it alone, the agitation will fall", he warned. Expressing regret over voter apathy in the southwest, Fayemi said a situation where the total number of votes cast in all the states in the region was less than 50 percent of the total registered voters is worrisome. "in the last presidential poll, Ekiti registered 909,000 voters , only 381,000 voted, 0sun 1.67million , only 737,000 voted, Ondo, 1.8m registered , 586,00, Oyo, 2.7m registered , 891,000 voted, 2.36m registered in Ogun, 605,000 voted and Lagos with 6.3m, only 1.56m voted. He said whatever might be the reason for the low turn out of voters must be critically examined in order to properly correct the situation. "This might be caused by deficit of trust or fraudulent multiple registration, but whatever the case was, as long as we remain a constituent part of this country, ARG should reflect on this and act appropriately. "If it was as a result of deficit of voter education, then the ARG and governments need a lot to do." Governor Fayemi said the Yoruba Academy and the DAWN Commission should also help look into issues that directly affect the region including voter apathy, influence of religion, economic development among others. Also speaking at the event, the governors of Ondo State Mr Rotimi Akeredolu and his Osun State counterpart, Gboyega Oyetola, said all the distinguishable traits of the southwest region initiated during the old western region must be brought back in the interest of the zone. The Osun governor, who was represented by his Chief of Staff, Dr. Charles Akinola said: " the Yorubaness in us and those things that separated us from others are our developmental drives, our intellectual rigour, our brilliance, circumspection and those values however, have not really taken us to where we deserve". "We have to be really worried that the instability and insecurity in the sahel has started affecting us and we need to get worried.
" We knew we had to think outside the box in the southwest on how to bring our own paradigm and we thought of Development Agenda for Western Nigeria (DAWN) to work on how to put us back on the right track. The National Chairman of the group, Hon Wale Oshun, reiterated the issue of restructuring and advised that it should be taken back to the front burner to benefit the Yoruba race. "The Yoruba people are progressive people. We are lovely and we care for each other . We are welfarists and we remain the same despite out stand in the just concluded governorship and legislative elections.
" All we want as a people is to ensure that our interests at the national level are protected and that we get a fair deal in the scheme of things". Oshun, however, expressed feat that Yoruba language is fast going into extinction due to paradigm shift caused by globalisation and laxity on the part of some parents. 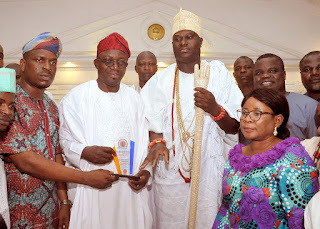 Pix: The Ooni of Ife, HRM Oba Adeyeye Enitan Ogunwusi, presenting a plaque to the Guest lecturer / Chief of Staff to Ekiti State Governor, Hon Biodun Omoleye, flanked by other participants at the annual lecture/award of the Yoruba Youth Council, at the Ooni Palace, Ile -Ife.... at the weekend.